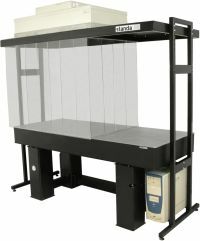 Laminar Flow Workstation 1CB is designed to provide a clean environment in any laboratory or workshop. Our filtering unit 1CB consists of a HEPA air filter and a steel frame complete with odorless plastic curtains. The vertical aligned flow of filtered air ensures that clean air flows uniformly over the workstation, keeping your samples, or optics in a clean managed environment. In a laser optics manufacturing, a laser repair or research environment, cleanliness of optical surfaces is imperative. The millions of particles present in most laboratories can fall onto optical surfaces, or they can be carried to optical surfaces by the energy in a laser beam. Once on the surface the lasing beam will burn the particles onto the coating, causing attenuation of the intra cavity energy. In addition the burnt particle will absorb more energy and cause localized heating on the surface of the optic. The localized heating can cause thermal lensing and damage to the optical coating. When adding the 1CB to your optical table you remove the particles and therefore the potential damage to your optics. As an example model - 1CB-08-20-TS combines the proven 1HT08-20-20 (800 x 2000 x200mm) honeycomb tabletop, the sturdy 1TS05-12-06-AR table support and the NEW 1CB-08-20 air filter unit complete with curtains. For greater stability and performance we suggest ordering a Vibration Isolation System 1VIS (1CB-08-20-VIS) instead of static rigid supports 1TS. Detailed information on Tabletops can be found here, on vibration isolation system here and on static table supports here. If you already have your optical table set up and wish to add the filtered air unit to your table, we can provide any custom size to suit your needs. Quantity of HEPA filters can be increased according to the customer's application dimensions. Please note, that the filter holding steel frame has a cross-beam located directly under the tabletop; when ordering, make sure to specify available vertical space under the tabletop. Featured units can be also ordered separately. OEM versions offer further customization - you can also define full or partial coverage (any sizes) of shielded space. Low sound, low watts, low profile, and low operating costs. Three speed switch features low, medium, and high settings; standard on all 2 ft x 4 ft (600 mm x 1,210 mm) and 2 ft x 3.5 ft (600 mm x 1,057 mm) units. Solid-state speed control standard on 2 ft x 2 ft (600 mm x 600 mm) and 2 ft x 3 ft (600 mm x 905 mm) units. High Efficiency Particulate Air (HEPA) UL 900 Filter: 99.99% efficient @ 0.3 micron. Snap-in pre filter allows for easy replacement and maintenance. Tested to IEST recommended RPC standards. UL listed (120V, 240V, 277V) with standard UL 900 filter.